Kolter Group, the developers of the recently constructed ONE St. Petersburg building, are proposing a second condo tower just three blocks south of ONE. According to documents found online, which are soliciting EB-5 equity investments for the project, Bayfront St. Petersburg will be very similar in design to its predecessor, ONE St. Petersburg. Like ONE, the tower features a contemporary design with floor-to-ceiling glass windows, high-end finishes, and open floor plans. Units at Bayfront will average around 2,000 square feet with an average sale price of $1.2 million which is slightly higher than the $1.1 million average for units at ONE. The base of the building will have 10,000 square feet of ground floor retail, which will be sold as retail condominiums, as well as a residential lobby. Levels two through six will feature parking for the condominium units as well as for the Hilton Bayfront Hotel, which is expected to have control of at least 205 spaces in the garage. During construction of the building, the developer will be required to pay for additional parking to temporarily replace to Hilton’s guest parking until the garage is complete. Residential units will be housed on floors six through 33 with floors 34 and 35 housing the building’s penthouse suites. A sales center is slated to open in summer 2019 which could coincide with the development’s groundbreaking. While the building would likely need to hit a presale threshold before construction could begin, they likely have a built-in advantage considering there was a waiting list of buyers for units at ONE St. Petersburg. Smith & Associates is expected to handle sales for the building and many of the wait-listed ONE St. Petersburg buyers would likely be interested in units at Bayfront St. Petersburg. Construction of the project is budgeted to cost over $200 million and completion is expected in late 2021. 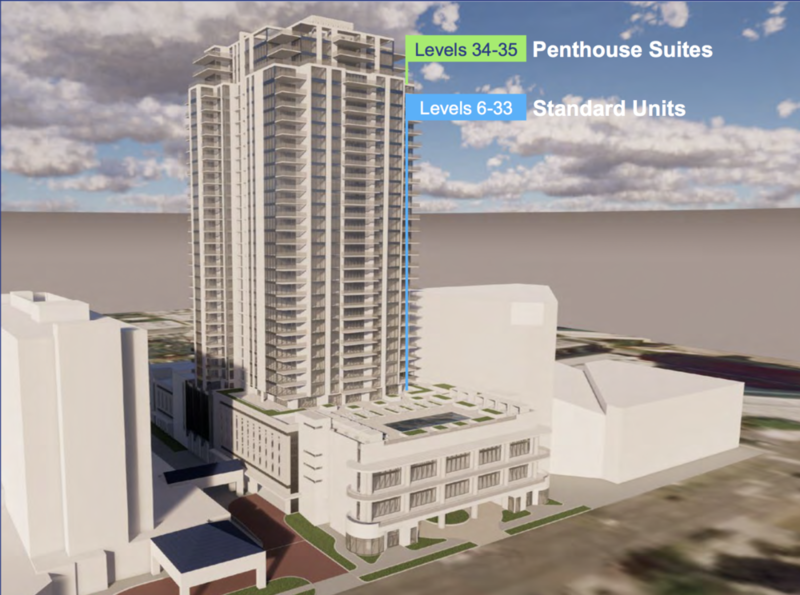 At just over 400 feet, Bayfront St. Petersburg would become one of St. Pete’s tallest buildings, second only to the 450-foot ONE St. Petersburg. Of course both buildings will likely be dwarfed by the Red Apple Group’s 400 Central project which is expected to break ground in 2020 and rise to around 550 feet. With the city’s skyline growing each year, Downtown St. Pete is quickly becoming one of the preeminent downtowns in the southeast.